In a word... *WOW* If you are thinking of a control set without a spinner, you really have to reconsider! The Oscar spinner is really an excellent piece of work. For specifications and details, visit our spinners page or their home page. For my first impressions, read on. 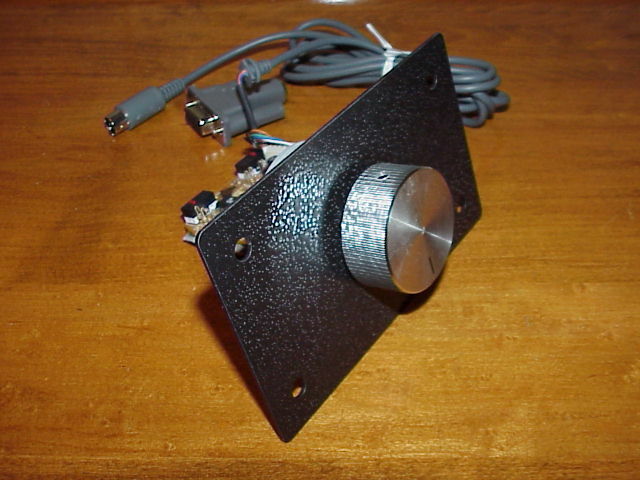 The Oscar spinner is a pre-assembled mouse-hack with a PS/2 connection, and a PS/2 to serial converter. I tested it in the PS/2 configuration under Windows ME. I attempted to test it in the serial configuration, but was unable to get it to install. HOWEVER - it's not the fault of the spinner, but my computer. It wouldn't install two other serial mice either, so something's wrong with my configuration. I installed the spinner via serial port on another machine and it detected as a Netmouse. I installed it with the standard serial mouse driver, and it worked fine. The fault was in my test computer. Worked fine in PS/2 mode and that's what I tested. Click for larger image (new window) The first thing I did after booting up was to simply give it a spin. The knob spun smoothly, floating left and right across the screen without hesitation. My Oscar came equipped with the aluminum knob, and it felt quite comfortable and looks fairly attractive. Several flicks of the knob each averaged 3 to 4 seconds of spin time before it stopped, with smooth motion on screen. The knob had a slightly perceptible wobble when free spinning, neither felt nor seen when turned while being held. No affect on game play or performance whatsoever. It was probably due to being slightly off-center on the shaft, adjustable with the mounting screw. I'll play with that more later. I tested in various games under MAME (Pentium Pro optimized version), in a DOS window under Windows ME, and also in MAME32. While testing, I did not notice any "back-spin" - where the mouse is spun too fast in one direction and actually moves in the other due to some property of the mouse sensitivity and the spokes on the wheel. You've probably seen the like watching car tires on the highway -- at faster speeds they sometimes seem to be moving backwards. Click for larger image (new window) So far it was all done free-style, without being physically installed in anything. Don't laugh at my mounting job... ok laugh, it's pretty ridiculous. However, it held the spinner in place just fine for testing. Cutting a hole in the cardboard somewhat smaller than the mounting plate, then screwing it down was very easy, and is probably how I'll mount it permanently in a control panel. I tested the spinner with Tempest, Warlords, Circus, Arkanoid, and Block-Block. One thing I haven't mentioned is that the spinner direction is reversed. I.E. When I spun left, it moved right, and vice versa. Now, this isn't a contradiction of what I said above. When I spun it so that I expected it to move left, it always moved left. They mention this on the web site, and MAME is equipped to handle it. In each game, you simply configure MAME to reverse the direction. The reason this happens is just a function of a mouse hack. When you move a mouse on the table, things are actually happening in reverse. When you move the mouse right, the ball moves left. Try it - pick your mouse up with the ball facing down. Without pushing up too hard on it, move the ball left and watch the cursor go right. Move it right and watch it go left. "I made two like that. Since those two, it has been corrected. I have moved the PCB completely off the spinner, to help correct that bug and to also make a much shallower mounting depth." So - on each game I had to configure it to reverse the direction. I wasn't able to find an entry in the MAME.CFG or documentation to make that the default, so I had to do it per-game. Kind of annoying, but it only had to be done once. Suggestions welcome. Conclusion? Playing games with the Oscar spinner is thoroughly enjoyable. After configuration the spinner works great with no quirks or flaws. It looks nice and seems solidly constructed. I hadn't been in a hurry to get a spinner installed - I have a HotRod, Stick-It, and CustomArcade and have enjoyed playing games with all of them. However, now that I've used a spinner, I have to get one hooked up permanently! Playing with a spinner is da-bomb! I expect many happy hours playing Tempest again, and cannot wait to hook up a trigger grip joystick to play Tron. You may never hear from me again! Two thumbs up for the Oscar spinner! I expect people will ask, "Now that you've reviewed both, which would you pick between the Oscar and the Fultra?" It may sound like a cop-out, but I really can't say one was a better choice than the other. Considering installation, configuration and game play issues, after all's said and done it's a wash. I like both of them, and will have one of each on my spinner control panel. There *are* differences between them (and they both have branched out to different offerings as well), and my advice is to use the other factors besides gameplay/installation to decide. Interface, pricing, dimensions, etc., based on personal preference should be your determining factors.